I picked this up a while back together with the moisturiser from the same line. I couldn't remember how much it cost, and I can't seem to find this product on L'occitane Malaysia web store anymore which makes me think that the toner is being discontinued. It really took me that long though to start on using this toner because I have had my favourite. Recently I rediscovered the bottle again inside my skincare drawer and thought of using before it approaching its expiration date. Mine here in a deluxe travel size bottle because it was a part of a promotion. This size is not available for purchase but they do have a slightly bigger bottle that would cost you around RM100(? ), I cannot remember. Expensive? yes, it is, but it's L'Occitane, a boutique brand (which literally means that I'm paying for the brand). A little info from the brand. "This alcohol-free Angelica Face Toner, enriched with angelica essential oil and water, moisturises, refreshes and rids the skin of impurities. After use, skin is soft, radiant and ready to absorb all the benefits of your daily skincare regime"
and here I'm going to quote what L'occitane has to say about Angelica plant. 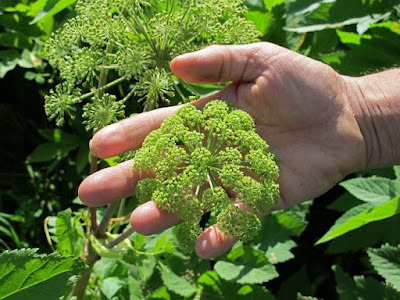 "Angelica is an exceptional plant that grows incredibly fast due to its hydration capabilities. L'Occitane has placed this amazing plant at the heart of a complete face care range to intensely hydrate and revitalise the skin. Both angelica essential oil and angelica water have been used in our collection of face care products which help to restore the skin's natural beauty". Sturdy plastic bottle that is lime green in colour, it doesn't dent easily like Good Virtue's Co. Brightening Facial Toner bottle, a toner that I've reviewed some time ago. I like how L'occitane uses a see-through packaging, something that I know I'd appreciate a lot since I could tell how much of the product I've been using but just to be clear, it's not the best packaging in term of product stability so make sure to store the bottle away from the sun to keep the formulation safe. Like the moisturiser bottle, there is a braille label engraved on the back of the bottle as you can see below (small dots on the upper side of the bottle). This is what makes L'Occitane packaging different from others! Although the process might cost money (hence consumers get expensive products), it's a good deed by the company to make their products accessible to everyone. It all started when the founder of the brand noticed a visually impaired women sampling perfumes in one of his L'Occitane boutiques. 1. Through my search on Google Scholar and few journal sites, I haven't found an extensive amount of research on the benefit of Angelica plant notably in skincare. The plant though, is known as one of the traditional medical herb used by natives in America and China. L'Occitane claimed that the Angelica plant exhibits almost similar properties to Chinese ginseng, it terms of its toning, moisturising and revitalising the skin. There are quite a number of research focusing on another species of Angelica plant, which is Angelica dahurica and Angelica sinensis, but then again, it's not something that L'Occitane used to formulate their skincare, they used a plant species called Angelica archangelica. 2. Water is the main ingredient and for the next 3 following ingredients, Glycerin, Polysorbate 20 and PEG-7 Glyceryl Cocoate, act as emollients and what give the skin a moisturised feeling. Polysorbate 20 (a sorbitan) and PEG-7 Glyceryl Cocoate (made from glycerin + fatty acids from coconut oil) also play the "surfactants" role in the formulation. You know sometimes when water and oil don't mix, then surfactant is needed to create the oil-in-water emulsions. There's also a present of Ethylhexylglycerin (emollient) in the formulation but in much lower concentration % (since maximum % of peppermint oil is 1%). 3. Fragrance, very high up on the list. Bad, L'Occitane, bad because fragrance or perfume is already a well-known skin irritant (varies upon the person). 4. Next, we can see a bunch of plant oils, Angelica archangelica Root Oil, Amyris balsamifera Bark Oil, and Peppermint Oil (you see now why surfactant is needed). I'm not sure about other oils but peppermint itself is a fragrance since it's aromatic and refreshing. There are pros and cons of using plant oil and extraction in skincare product as they can become irritants to some people, especially with sensitive skin. 5. The rest of the ingredients pretty much act as preservatives; Tocopherol (vitamin E), Sodium Benzoate, Potassium Sorbate, Phenoxyethanol, and Chlorphenesin. Both Tetrasodium EDTA and Trisodium NTA are chelating agents, they are not preservatives in their own but help in enhancing preservatives efficacy. They are also what make the pH of the toner, acidic. 6. There's also Limonene, a fragrance. It what makes the toner smells citrusy. Almost done with this and I've been using it for 3 months duration, not on daily basis. With this toner, the only way I use it is after I cleanse my face. I put some of it on a cotton pad and will follow up with serum and moisturiser. Below is how much the product left till yesterday. Is this how Angelica Root Extract smells like? lol. I doubt so, but I can best describe the scent as refreshing, like you know freshly cut grass with a subtle hint of bitterness from lemon or lime. I love it, I don't mind having a perfume with the similar notes coming from this toner. Whatever Loccitane used to formulate the fragrance of this, I'm in love. It reminds me of something green, from nature. The fragrance is quite strong when you take a sniff from the bottle, it's even high on the ingredient list. On the skin, it lingers for few minutes. Love-hate relationship. First, let me tell you what I like about this alcohol-free toner - the nice scent, and also how my face actually feels clean, refresh and much more awake after using it. Although the toner is categorised as "hydrating" instead of "exfoliating", it does pick up extra dirt and makeup on my face so I feel like it is necessary for me to use it with cotton pads. The consistency of the toner is light but not completely weightless, it leaves a sticky residue on my face which I personally don't mind. The toner gives me a slight tingling sensation on the upper side of my cheeks and also around my eyes (known to be delicate skin areas). I do not break out from using it but surely some part of my skin feel stressed out and uncomfortable. For most of the time I have it on my face, the burning sensation is still there indicating my skin is reacting badly to certain ingredients. I think I've already told you guys that most of the toners I've tried give me the same feeling except for the recent reviewed, Mamonde Rose Water Toner. So.. you know I'm not quite fond of this product. 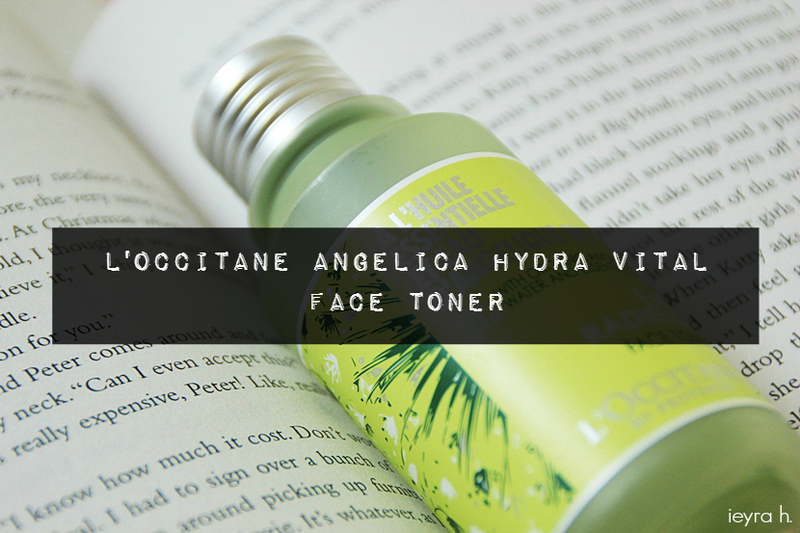 In store- L'Occitane Boutique, this toner is not available in their web store. 4/10, slightly below average. Ingredients are not so impressive but it's hydrating and moisturising. It's somewhat exfoliating too. Do take note there's another variant of Angelica toner from L'Occitane which is the "Angelica Lemon Ultra Mattifying Toner", designed for oily-combination skin. Maybe not due to its pricing and certain ingredients that my skin seems to react with. Only if you can tolerate heavy scents and your skin isn't sensitive to fragrance or essential oils. Hope this helps! What is your all time favourite toner? Let me know in the comment section below.